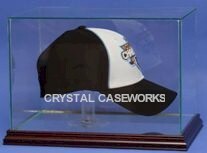 Custom display cases by Crystal Caseworks. 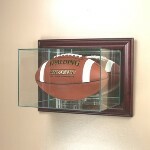 Glass and Acrylic Displays for your Baseball, Football, DieCast Car, Hockey Puck, Basketball, Doll. golf ball, basketball, hockey puck, beanie baby, barbie doll. Display case for collectibles and sports memorabilia. NO CHARACTER LIMIT!!! * Scroll down for more info. We specialize in Custom Display Cases. Horizontal and vertical displays for 1 football or 2 and up to 4 footballs. Some are wall mountable. Some are table top models. We have clear bases, black bases and gold risers or even solid wood bases. For 1 baseball, or if you have more than 1 baseball, we have displays for 2, 3, 4, 5, 6, 9, 10, 12, 15, 24 & 36 balls and more. For full size and even a mini basketballs. We make Soccer Ball holders for 1, 2 3, or even 4 balls. Stick and puck displays come in single desktop or multiple puck wall mount models. We have a single or multi case pucks, sticks, jerseys, etc. We have displays for multiple mini helmets. We have displays for 1, 2, 3, 4, 6 & 16 helmets. All of our glass displays come with a real glass mirrored floor. We have diecast displays for 1 car and up to more than 100 cars in a single case. We have wall mountable and table top models to choose from, 1/24 Scale - 1/64 Scale - 1/18 Scale - 1/43 Scale - 1/32 Scale - 1/25 Scale - 1/87 Scale - 1/8 Scale - Haulers - Transporter Trucks - Dually Banks - Hess Truck - Fire Truck - Hot Wheels - Matchbox Cars - Train Case - Sprint Car - RC - RCCA - USHRA - Indy Car - Pit Wagon - Revell - IRTL - Racing Champion - Action Pro Stock Motorcycle - HO - O . We have displays for all of your models. Our glass and acrylic doll displays are wall mountable and have either sliding or hinged doors with key locks or secure clasps. We can add mirrors, shelves, or any other option you want. We have a case for Barbie size dolls or any other size you need. We can make you a custom doll showcase in any size. Boxing equipment displays in acrylic and glass for 1 glove or 2 gloves, boxing trunks - shorts, head gear, or any other item you want a holder for. We have glass and acrylic display domes in a variety of diameter sizes including round 3" - 4" - 4-1/2" - 5-1/2" - 6" - 8" - 10" - 12". We have doll domes, platform domes, thimble domes, pocket watch domes and more. Our dome comes with your choice of wood or metal bases. Wall mountable or table top to hold 1 ball or multiple balls up to any number. Even stately hard wood designs. We have small , medium and large jersey & shirt cases that are all wall mountable and some have key locks. Whether you have 1 of these beanie baby plush bears, dolls, or several hundred beanies, we have the boxes you need. We have and acrylic, glass or wood shelf that is ideal for small nick-nacks, collectibles, or any other small item that you want to show off or protect. Cereal box holders in 3 different sizes to hold Wheaties and other boxes. Shoe and cleat display case in glass and acrylic for 1 or 2 shoes. Full page newspaper and magazine frames for current and old original issue SI Sports Illustrated , Beckett, Tuff Stuff & Life Magazines. We have flag displays for standard, commemorative and burial casket flags. Our flag cases are popular for military memorial flags. Some models have room for war medals. in any shape or size. EXAMPLE - Order a baseball display case that holds 20, 40 balls or more. You may only have a few balls for it now and don't need all of the nameplates right away. Well...as you get more, just tell us what you want engraved on the plates as you need them and we will promptly send them to you for FREE!!! The same offer stands for other display cases. Footballs, Diecast Cars, Hockey Pucks, etc. You get a free nameplate - plaque for each item in the case. We don't limit you! You want 1, 2, 4, 5 or more lines - NO PROBLEM. All laser engraving with your choice of custom color combinations. We can even do custom colors and fonts. EXAMPLE - Order a golf ball display case that holds 20, 50, 80 100 balls or more. You may only have a few balls for it now and don't need all of the nameplates right away. Well...as you play more courses, just tell us what you want engraved on the plates as you need them and we will promptly send them to you for FREE!!! *Free nameplates include up to 5 lines of text on most cases. We try not to limit you on the # of character per line, but most cases can only hold a plate that can take approx 30-40 characters per line. If the text that you request is too many characters for that particular case, we will let you know, otherwise we will simply use a larger plate. If you need more lines of text than are offered on the item page, please call us and we will be happy to make you a custom size nameplate. Due to the size of the cases, nameplates may not be included with some very small cases. Some cases only come with 1 nameplate due to the layout of the case. See individual items for additional info and/or restrictions. An additional fee may apply for custom fonts and special characters/symbols. Copyright 2012 Crystal Caseworks, LLC - All Rights Reserved. Items shown inside of the display cases are not include.